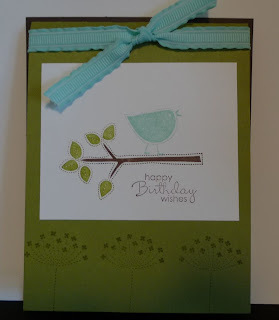 Karina's Kreations: Best Of Everything Card! I have another Best of Everything card to share with you today. I used the new In-Color called Pool Party with the matching 3/8" Ruffled Ribbon. I love this ribbon and have it in every color. I'm running another ribbon share with the new In-Colors. The cost $14.00 and you will get 2 yards each of 5 different colors. Contact me at kchin2@telus.net if you're interested.